The very portable Hotaru Compact Shower uses a proprietary filtration system to reuse the same 5 gallons of water for up to 50 showers. My wife and I have 3 kids. Between all the showers and baths occurring each week, we use a LOT of water. Every time I pay my utility bill I have a mild stroke. But what’s the alternative? Other than embracing terrible hygiene habits or becoming one of those total off-the-grid weirdos, I can’t think of a way to cut down on the amount of water being used in my house. Or I should say, I couldn’t think of a way…until I discovered technology like the Hotaru Compact Shower. Now let me be clear: the Hotaru Compact Shower isn’t designed for regular use in a house. It could certainly be used that way, but it is primarily designed for outdoor, “remote” places without access to water systems. Think of a construction site, or a campground, or a festival. The kinds of places where everyone regularly smells like fetid cream cheese due to lack of shower access. The Japanese invention uses multiple reservoirs in a plastic base to store and purify up to 5 gallons of water. Those 5 gallons can then be used approximately 50 times; that would allow a family of 3 to take five minute showers every day for 2 weeks. 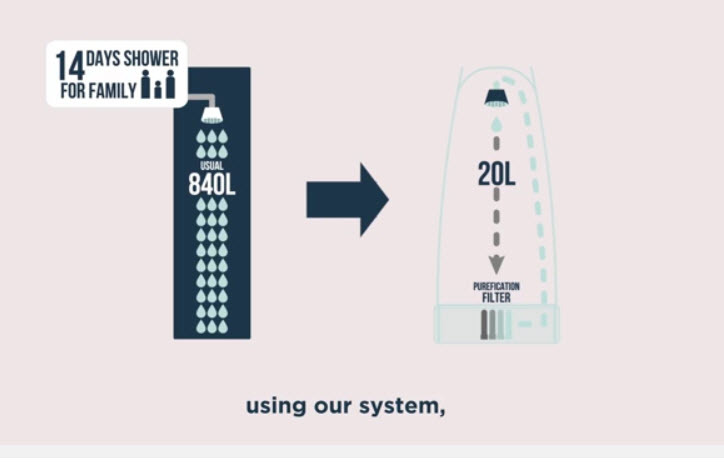 The company claims that the shower can recover and reuse 95-98 percent of the water used in each shower. The shower requires power to use, with a car hookup being enough for unheated showers. The water heater on the shower requires a generator or AC hookup. A small nylon tent encloses the shower, giving you privacy (of course, this can be disregarded if you’re at Burning Man). An internal pump pushes water out of the shower head at 60 psi, which is pretty impressive for a portable shower. As you wash, the drain in the floor collects all the water and pushes it through a proprietary purification system, ensuring that it’s clean enough to be used again. The purification system can filter out soap, shampoo, and dirt, although the company recommends using mild body cleansers for best performance. When all is said and done, 5 gallons of water can be purified and repurposed for 50 showers. There are some limitations to the device. Currently, it weighs around 70 pounds, which makes it impractical for backpackers. It also will have an initial price tag of around $3,000, which is a little steep for most off-the-griders. Despite these limitations, it’s hard not to see the potential in the Hotaru Compact Shower. It seems like the perfect solution for the RV traveler who wants an additional place to freshen up, or the festival-goer who actually wants to stay clean (there are a few). And with massive droughts happening in places like California, I can’t help wonder if a sustainable solution like this won’t become a necessity in the future. Awesome for camping and being off the grid. It should be installed in all RV’s if anyone really cares. Even with that extra weight, if you can find a way to get it out on the campsite, you are going to be money ahead with all of those showers you can take. what about maintenance? Being out and about for the weekend, this would be the first thing I think of if I want to take a quick shower. Just to get the grime off and feel clean again would be nice. And it would save so much water, don’t you think? If all of the campers were using these there would be less of a need to make sure your water tank is fill before your trip. Even with that weight restriction, it is quite small and would fit into any camper. Ideally you would want a hot shower, but in a pinch, on a hot summer night, at least you can get clean. Best option for an RV that I have seen in a long while. Thanks for showcasing this product! More saving water startups. There is something about this that makes people want to save mother earth. The $3,000 would be an investment no doubt, that price is not that bad. This would be something PERFECT for a camper or RV. Many of them already have showers and water tanks in them, but being able to recycle that water would be a bonus.